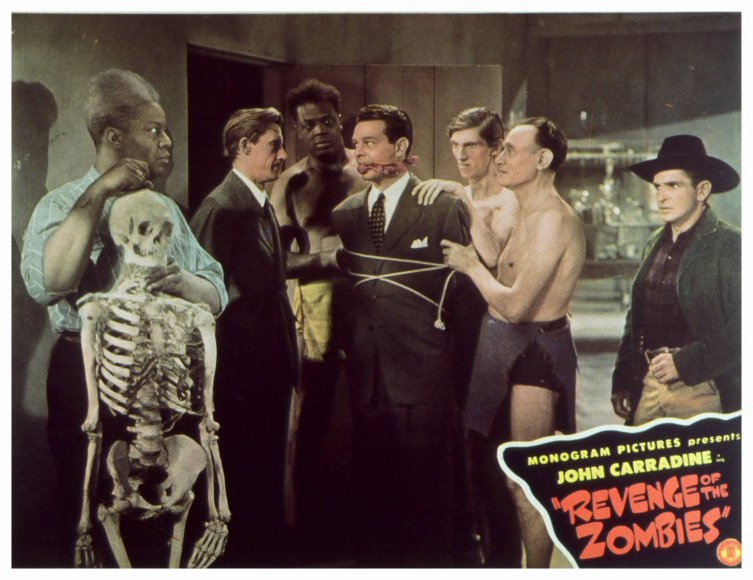 I’m sure many of our viewers are familiar with the old Universal terrors of the Thirties and Forties, the domain of Bela Lugosi, Boris Karloff, Lon Chaney Jr, John Carradine and many other classic Hollywood boogeymen. Those old guys didn’t just survive on big studio meals, however, and were just as busy in the lower strata of the film business, the much more threadbare B programmers of rattier studios such as Republic Pictures and Monogram. 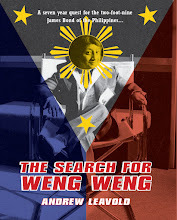 Dismissed by many as mere el-cheapo crowd pleasers, I find the B pictures enjoyably cheap and formulaic, relatively fat-free quickies with a charm all of their own. 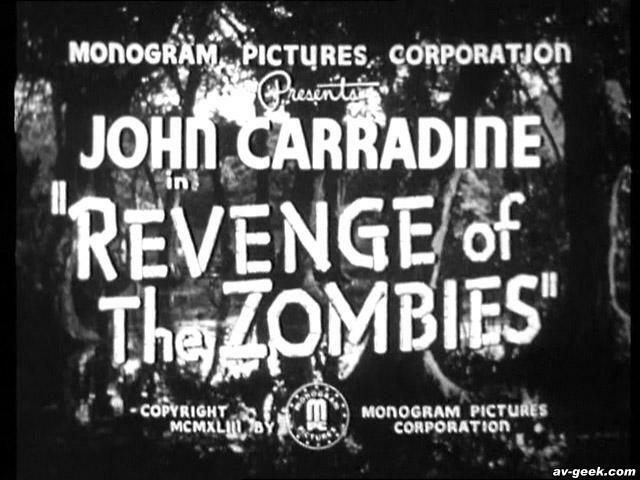 Intended as a sequel to the 1941 King Of The Zombies, Revenge… is more of a revamp utilizing some of the cast, and its adherence to elements already poached from Bela Lugosi’s White Zombie from 1933. Returning is Mantan Moreland, comedian from all-black vaudeville known as the Chitlin’ Circuit; as in King Of The Zombies and his long-running stint as Charlie Chan’s chauffeur, Moreland essays his driver role as the bug-eyed, superstitious and terrified comic relief, and like his contemporary Step’n’Fetchit, a wholly un-PC example of pre-Civil Rights Hollywood. 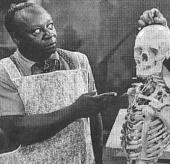 Conversely the film’s most interesting character is Von Altermann’s old African-American servant Mammy Beulah, played by Madame Sul-Te-Wah (also from King…), a D.W. Griffiths stalwart from such early epics as Intolerance (1916) and that grand ol’ ole to the KKK, Birth Of A Nation (1915). Unlike the “lordy lord” antics of the exasperating Moreland, there’s depth and a quiet dignity in Madame Sul-Te-Wah, not easy to maintain amidst the chorus of massas and sho ‘nuffs. The anti-Nazi propaganda may seem forced, but Revenge Of The Dead was after all released in the opening phases of America’s involvement in World War 2, and is infinitely more subtle than Hungarian-born director Istvan Szekely’s other film from the period, Hitler’s Women (also 1943). Both King and Revenge Of The Zombies must have made enough cashola for rival company Republic Pictures to release the exploitatively-titled Valley Of The Zombies in 1946. 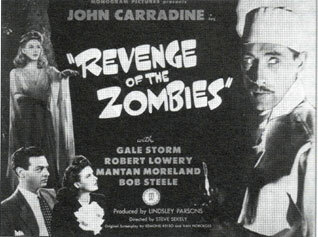 The film certainly wastes no time in plunging straight into the guts of the story: a tall figure in a top hat and cloak breaks into a doctor’s office at the hospital’s morgue and demands a supply of his rare blood type, only to reveal himself as Ormond Murks, the insane criminal mind the doctor had committed several years before for claiming to have found the secret of eternal life. Murks was later pronounced dead and interred in his family crypt, but has since existed somewhere between the living and the dead by stealing packaged supplies of his precious life fluid…until now, he decides, that fresher really IS better. Thus begins a string of murders throughout the city, all strangled, drained of blood and then meticulously embalmed. Chief suspects are the morgue’s resident couple Dr Terry Evans and Nurse Susan Drake, a wise-cracking pair of amateur sleuths equally at home prowling around mausoleums at midnight or napping on the morgue’s slab. 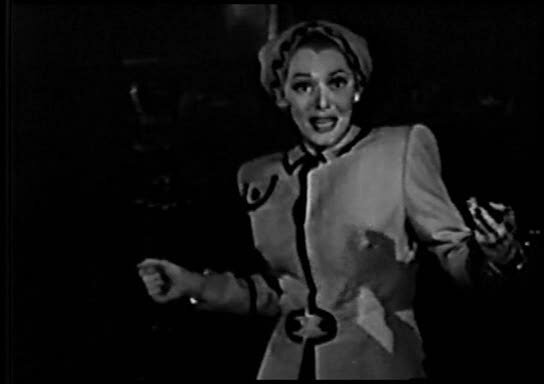 Naturally they’re two steps ahead of the bumbling Irish-American cops, which means the ditzy Nurse Susan is a sitting target for Murks’ dastardly plans. 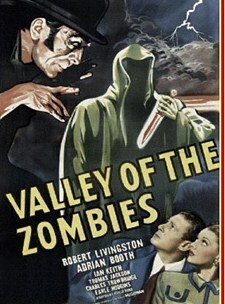 If ever there was a film screaming out for a name actor to carry it, it’s Valley Of The Zombies. 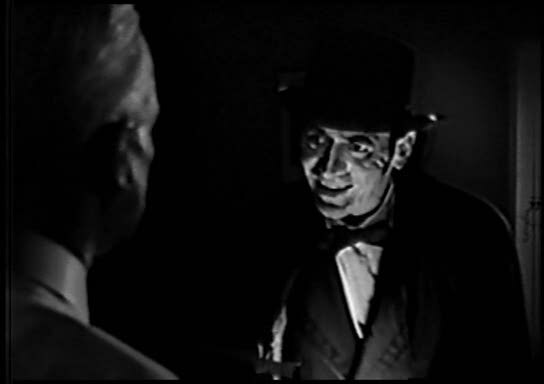 The role of Murks would have usually been reserved for Boris Karloff; instead we’re given Ian Keith, a salted plum of a stage actor who was once in the running for Bela Lugosi’s Dracula. 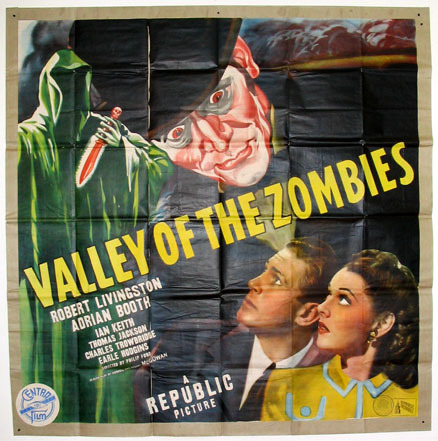 Here he’s more Tod Slaughter than Lugosi, an adequate by-the-numbers villain who sadly only ever hints at the evocative Valley in the title, its voodoo rituals and Devil’s potions the source of his secrets. 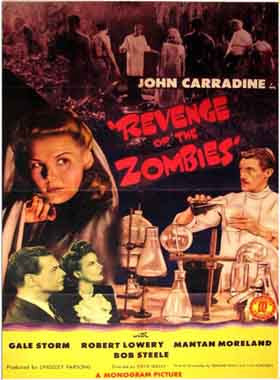 Thus we’re treated to one zombie-like scientist, and one hypnotized broad who acts like the living dead. Thanks, Republic, you suckered us alright. 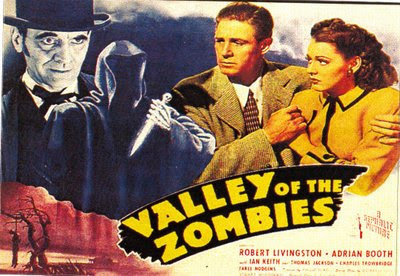 Still, Valley Of The Zombies is brisk, ghoulish fun, in the tradition of many B detective serials of the era, and a throwback to a pre-George Romera era when the word “zombie” had an air of mystery about it.